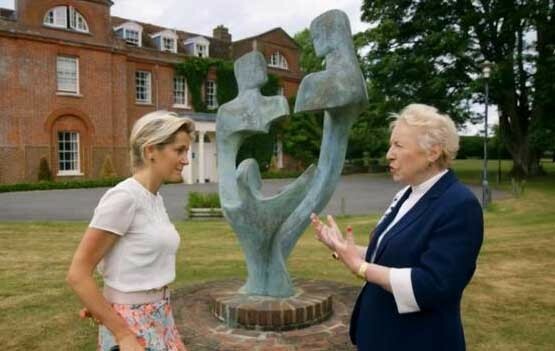 A couple of weeks ago my sculpture was featured on BBC2 when Martha Lane-Fox discussed the merits of using sculpture to help create a special environment for autistic with philanthropist, entrepreneur and business woman, Dame Stephanie Shirley. Her philosophy is that it helps both the mental and physical health of those patients. Martha Lane-Fox and Dame Stephanie Shirlthe mental and physical health of patients. Having had an autistic child herself, who sadly died at the age of 35, she felt that she would like to create an environment in which he would have been happy and allowed to develop to the best of his ability. So in 1999 she set up Prior’s Court in Berkshire, a residential school and charity which specialises in the treatment of autistic children and young adults. She has filled the interior of the buildings with a collection of artworks which decorate the public areas and classrooms. In the spacious grounds there is a sculpture trail of work by a number of well-known artists where the patients can enjoy the peace and quiet in a beautiful setting. My sculpture, ‘Joy of the Family’ was placed in a prominent position in front of the main house. When I was first approached to provide a sculpture I felt that it was very important that I should have been given the opportunity to be involved in a project that would enhance the lives of so many young people. It was apparent from the moment that Dame Stephanie saw the maquette that the emotions I had tried to express were just those that she envisaged – a calm, serene family group. The whole programme is available on BBC Iplayer until 12 August but the piece about the School and the sculptures begins at 25 minutes into the programme.